El Camino College recently celebrated its 67th Annual Commencement. Among the Class of 2014, 1,125 students received associate of art degrees, and 652 students received associate of science degrees this year. In addition, 402 certificates were awarded. This year, the excitement of commencement was captured in hundreds of online images and posts from students who snapped photos and shared what it is like to be an El Camino College graduate. The proud graduates and their loved ones took to social media to celebrate the Class of 2014, posting photos and describing special moments from the May 16 commencement ceremony. A collection of students’ graduation photos and posts on Facebook, Twitter and Instagram were compiled into an easy-to-read story on this online 2014 Commencement Storify album. El Camino College students, their families, faculty and staff were provided an opportunity to share and take part in the larger celebratory conversation that was happening online by using the unique hashtag #ECCGrad, which was a huge success, resulting in more than 200 unique tweets on Twitter, Instagram photos and Facebook posts. 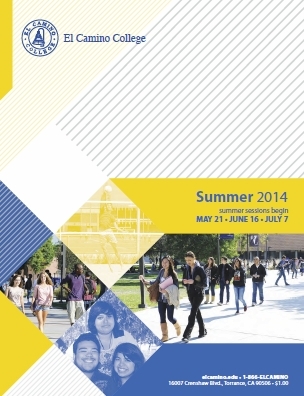 Hundreds of classes have been added for Summer and Fall 2014! The added courses cover a variety of subjects, including high-demand classes in English and math. Click here to view the class schedule. Students are encouraged to register as soon as possible. 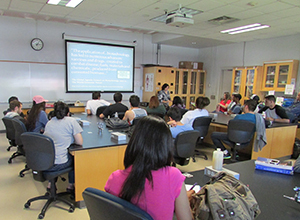 The eight-week summer session began Monday, June 16; the second six-week summer session begins Monday, July 7. 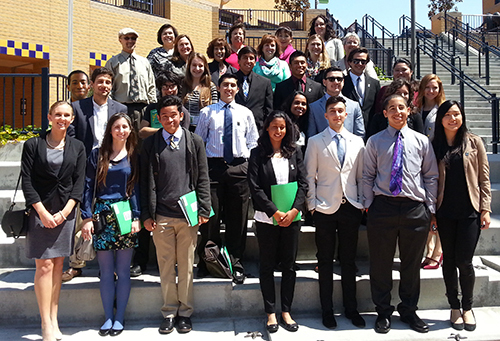 A grand opening recently celebrated the new El Camino College STEM Center. The STEM Center will support student success, retention and graduation by serving as a hub for tutoring and academic support programs. 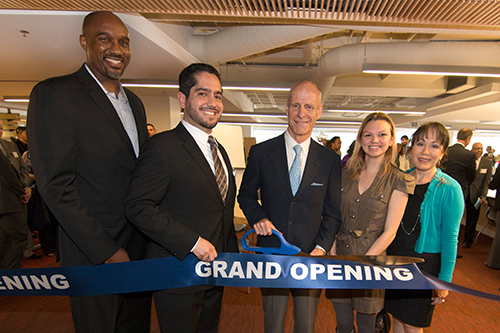 This new $3.4 million, 9,334-square-foot learning support center is designed for students studying STEM (Science, Technology, Engineering, Math) disciplines. The STEM Center will house the highly-successful Mathematics, Engineering, Science Achievement (MESA) program and provide STEM enrichment and outreach activities. The new STEM Center and numerous other improvements on campus were made possible with funds from the 2002 Measure E facilities bond. The new READ poster “celebrities” for 2014 were recently revealed at a celebration of reading and libraries in the Schauerman Library Lobby. This year’s celebrities are Lauralee Welsh, English professor in the Humanities Division, and Daniel Berney, dance professor in the Fine Arts Division. They were selected for their longstanding dedicated support of the Library and for fostering student information literacy skills and the use of Library resources. 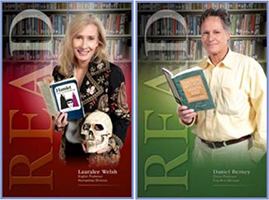 Since 2005, the El Camino College Schauerman Library has celebrated reading in the month of April by creating posters featuring college personalities posing with their favorite books. The event is part of the Library’s annual celebration of National Library Week/Month, and is designed to remind everyone on campus, especially students, of the importance of reading and libraries. ECC’s first-ever STEM Week was a great success – a celebration of the STEM (Science, Technology, Engineering, Math) disciplines where students and guest speakers demonstrated the opportunities and innovations found in these fields of study. The weeklong celebration was organized in conjunction with the opening of the college’s new STEM Center, and also included student club demonstrations, academic presentations and career workshops. 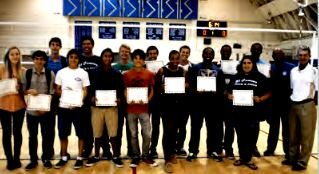 the two-year awards, brings the high school scholarship program’s annual total to about $69,000. The California Community Colleges Endowment Fund (Osher) will also provide more than 140 $1,000 scholarships this year. 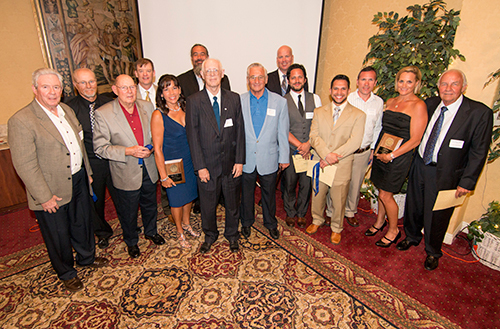 Congrats to all those honored at the 26th Athletic Hall of Fame Induction Dinner Ceremony. The 2014 El Camino College Athletic Hall of Fame inductees include: Nick Carr, 1978-81, cross country/track; Sylvia Gurrola, 1980-82, volleyball and softball; Dennis Hansen, 1960-61, cross country/track; Tike Karavas, 1956-59, basketball; Heidi Nelson, 1999, swimming; Scott Provin, 1983-84, football; Chuck Shaffer, 1980-present, football (meritorious); Kenny Talanoa, 1991-92, football; and the 1963 State Champion Golf Team. Student honorees include the 2014 Athletes of the Year: Roy Powell, volleyball, and Crystal Lizaola, track & field. The Norm Verry Scholarship, honoring scholar athletes at El Camino College, will be awarded to Liliana Lopez, track & field and Clarizzah MacAtugal, basketball. 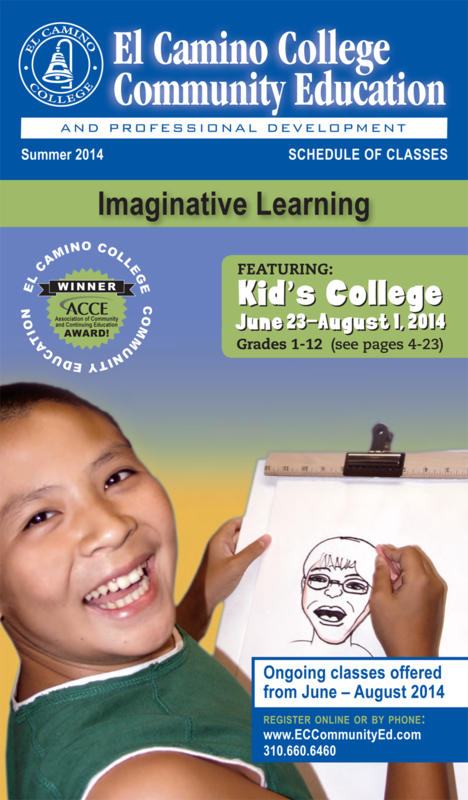 Registration is now open for Kid’s College this summer! Kid’s College has something for all area youngsters in first through 12th grade. Art, writing, music, woodworking, sports, science – the list goes on! Classes are offered from June through August. Sign up now for some serious learning fun! Click here for the summer schedule. 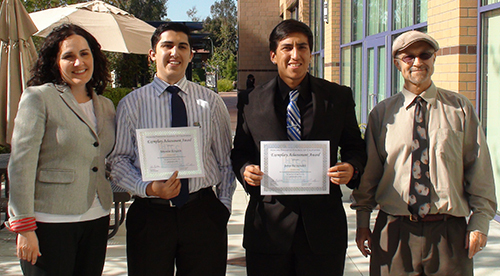 The El Camino College Foundation is seeking nominees for the 2014 Distinguished Alumni Award. 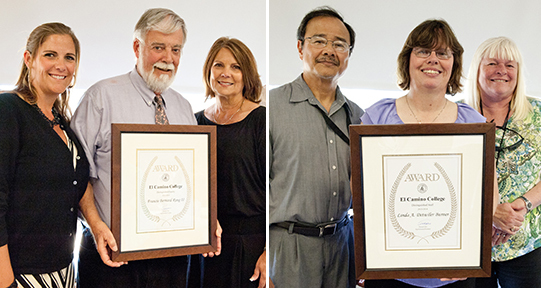 This award recognizes and honors outstanding ECC alumni for their contributions to the community. Nominees have a proven track record of achievement in their chosen career, service to the community, or area of endeavor, and have gained local, state, or national recognition for their involvement. In addition, 10 years must have elapsed since candidates attended El Camino College. Nomination forms must be returned to the Foundation by July 31. The Distinguished Alumni Awards Dinner is scheduled for October 4. For more information, contact Katie Gleason at extension 3683 or click here.